In today’s session, this is something different from every other episode we have ever done. Rather than sharing lots of information, we are going to simply slow down by doing a 20 minute or so mindfulness exercise. If you have not listened to the previous episode which is Session 40, I would highly recommend you do this first. 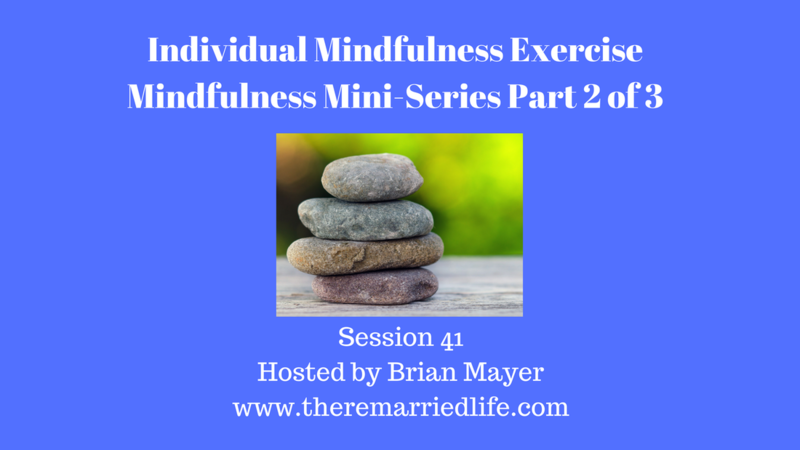 That episode will give you an introduction into mindfulness. Before we begin make sure that you are not doing something else especially anything that requires your full attention like driving or taking care of the needs of others. If this is then case, then return to this at a time when you can devote 20 minutes without distractions. Make sure to put away all distractions and to put your phone on “Do Not Disturb” if you can. In this exercise, you will be doing this on your own. Ok, let’s work on beginning. Find a comfortable place to either sit with feet on the floor and legs uncrossed. You can even lie down if you would like. Gently move your body around until you get comfortable. Once you feel settled, I want you to take a deep breath in, hold it for a few counts, and then exhale. Take another deep breath, hold it, now exhale. Again take another deep breath, hold it, now exhale. Once more take a deep breath, hold it, now exhale. Now close your eyes if you have not already done so. Shift your focus to your body. Do you notice anything? Simply take note. You are not trying to change anything. Simply notice bodily sensations. Take a deep breath in, hold it, now exhale. Now just simply breath as normal. Follow your breath. Feel the cool air enter and then as you exhale feel the warm air as it leaves. Simply be with your breath. Has your mind wandered? If so that is okay. Return to your breath. Are there any feelings that are coming up for you right now? If so notice them without trying to change them. Return back to your breath. Noticing the stomach rising and falling with each breath. Have you gotten carried off by any thoughts. Maybe there is a worry or a plan for the day that you got swept away by. It’s okay, simply return back to your breath. Picture your thoughts like clouds drifting in the sky. When we choose to linger on a thought it is as it has stopped moving and is now lingering. When you realize you are being swept away by a thought, simply return back to your breath. Allow the thought to simply drift away. For the remaining time, I am going to go away. I want you to continue to focus on your breath and your body. If sensations arise in your mind of your body, simply take note of them. There is no need to change them. If you find yourself getting carried away with your thoughts or feelings, it’s okay just return back to your breath. It is time now to prepare yourself to arise from this exercise. Slowly open your eyes. Maybe have a little stretch. How did you do? How did that feel? If you found yourself being distracted by your thoughts, this is completely normal especially if you just started to practice this. This mindfulness exercise is not a quick fix, but rather a longer term solution to help with stress, worry and anxiety. You may consider returning to this everyday if you need it. So that is all for today. I know you have either gotten your day off to a good start by doing this or maybe this is an ending or you may have even needed this in the middle of a hectic day. Whatever works for you, just keep at it. Remember next week’s session will be a similar exercise, but in Session 42 I want you to do this together as a couple if you with someone right now. If not keep repeating this session as needed. It would be extremely helpful, it you would consider leaving a rating and review on Apple devices at iTunes or on Android devices at Google Play as it will help the podcast reach others who need help in rebuilding life and relationships. ​​As always remember that marriage is nothing something you have, it is something you do. Talk to you next week unless you are binge listening in the future in which case I will talk to you in about a minute! Take care.